Is there social support for the implementation of large-scale landscape machines in populated regions? What is the role of (local) people within the landscape machine concept? What allowances does the re-design of landscapes offer for the creation of (local) maintenance structures and appreciation? These are the type of questions that came to mind when we first encountered the landscape machine concept. We were of the opinion that the concept would benefit from an increased attention to social aspects of landscapes and landscape change, especially if a large-scale landscape machine is intended to reach implementation in a societal context. In our thesis project we investigated the issue of social support for large-scale landscape regeneration projects, which could include landscape machine designs of the ‘system repair type’. In the thesis project, we introduce the ‘Social Feedback Model’, which enables analysis of complex social-ecological systems. The phenomenon of ‘social feedback’ between landscape appreciation and consequent attitudes and behavior towards the landscape proved particularly helpful in understanding social mechanisms that either disable or support landscape change and large-scale regeneration efforts. 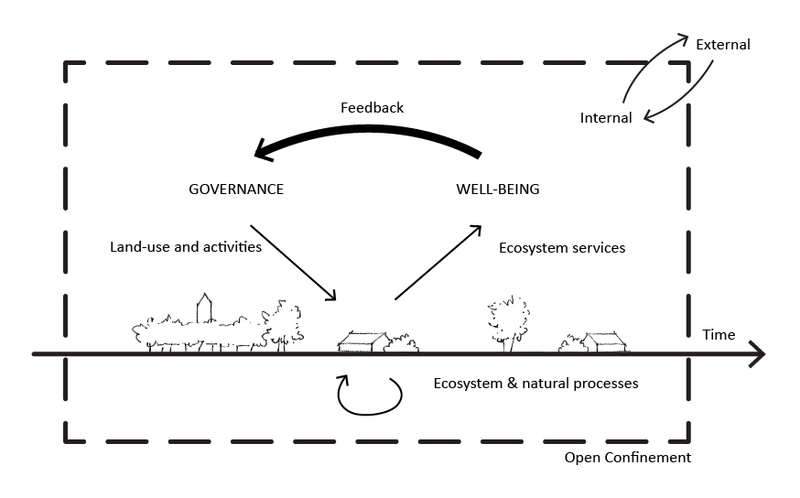 Through the use of the Social Feedback Model in a multidisciplinary literature review, three case studies of regeneration projects and an analysis of the existing socio-spatial situation of the Vechtplassen region in the Netherlands we increased our understanding of social mechanisms. 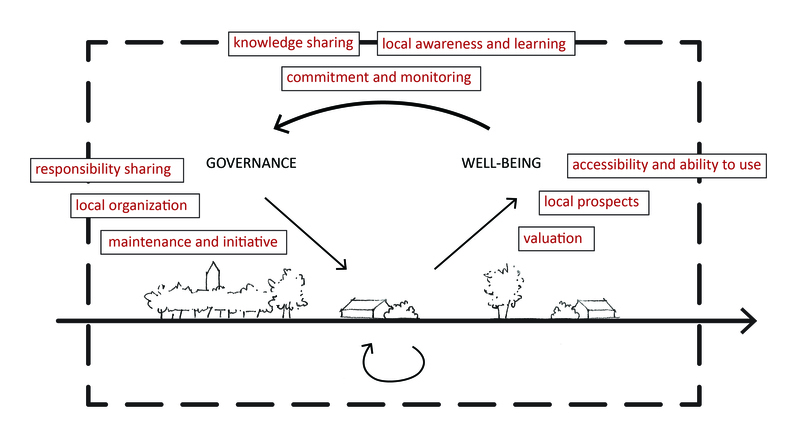 We were subsequently able to introduce conditions that underlie critical support for landscape regeneration, based on the need for empowerment of local people in the landscape on input (governance), output (use and accessibility) and social feedback level (knowledge and awareness). These conditions imply the need for new social contracts for responsibility-sharing between governments and local parties, the creation of local capacity through communal networking and agreements, and prospects of (new) direct relationships between local people and the natural environment. 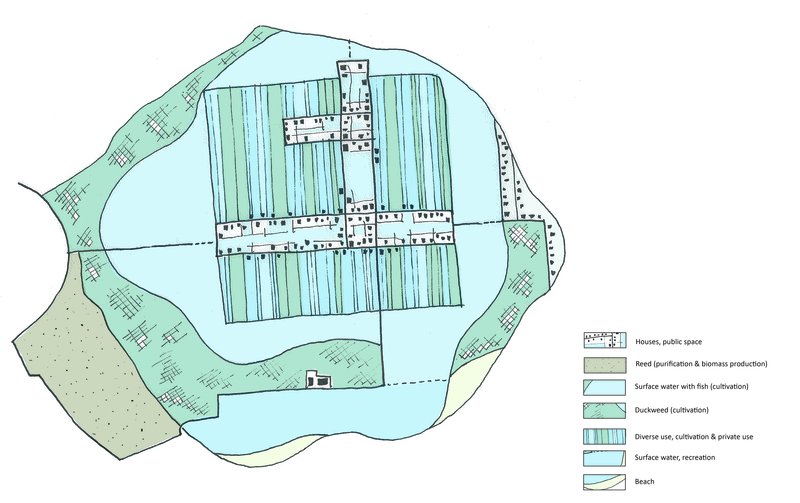 The conditions are applied in a strategy for socially supported landscape regeneration as well as in a spatial design for the Vechtplassen region. In this way we show the possibility to deliberately plan and design for landscape regeneration that is supported by local communities. Application in design also leads us to our final suggestion towards the landscape architectural discipline: to increase focus on the facilitation of social processes, the exchange and accessibility of knowledge and the shaping of new ways for local people to be directly connected with the natural system. This project shows the concerns that may come up when large-scale spatial plans like landscape machines are proposed to local people in their social/spatial reality. Concepts like the landscape machine will need strategies in order to avoid local resistance to change. We therefore propose that designers do not only occupy themselves with the design of the technical landscape machine, but that they also use their expertise to tackle social issues and build social support, and that they think of ways to embed (roles for) local people within the machine landscape. This will greatly affect the ability of these types of large-scale plans to leave the drawing board and become reality. Program 2: an interactive platform on which knowledge and information about the area can be shared, lowering the threshold for people to be well informed, gain awareness and connect to each other. Program 3: facing (sometimes drastic) changes, communities are encouraged to get together and form local agreements and responsibility structures. Local visions get institutionalized by the municipality. 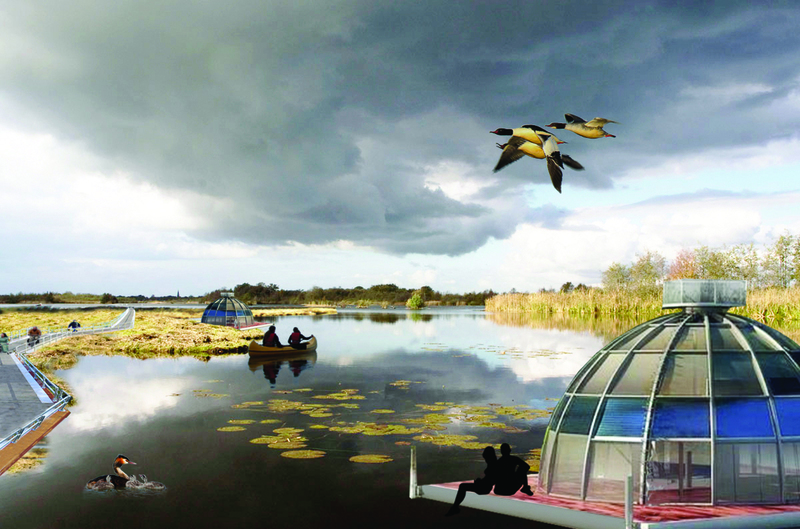 Example of an initiative: the ‘houses of nowhere’ (inspired by the concept of ‘huisje van niks’, WTS architecten) form an example of new entrepreneurial initiatives that can take place in a changed (partially inundated) landscape. People can ‘sail’ with the floating, autarkic houses through the landscape, and stay overnight at a quiet place. Another example of an initiative: the ‘water machine’ landscape can be seen as both a ‘productive’ and a ‘system repair’ landscape machine, triggered by the need for inundation of a deep reclamation. The plan of combining fish and duckweed farming with recreational initiatives in an accessible landscape resulted from the wishes of the local community and is carried by a local cooperative in which (most) local people own shares. Shouldn’t it start with questioning the concept and terminology itself instead of asking these – and other – questions within the given framework of the concept? What I would like to know, is whether the thesis has lead to a revised ecosystem-based concept and (hopefully) to superseding the technocratic and (in my view) misleading word “machine” (or “machinery”)? Dear Tom, thank you for your discussion. Firstly, we are well aware that the two words ‘landscape’ and ‘machine’ are dissonants in many ways; if that is what you refer to as technocratic and misleading? The dissonance is on the other hand exactly right, if you consider an important pragmatism in the field of large scale landscape interventions: (1) landscapes are mostly created by (generic) professionals, only dimly including local people. (2) Landscapes, for a large part, serve a purpose, in most cases as agricultural production area, as natural reserve or as urban/infrastructure territory. These two pragmatic elements make it more feasible to consider the machine part of the landscape. Being an optimized production facility for desired outcomes. Any dissonance with local people and out of radar ecological developments, is what interests us, as part of the landscape machine concept. Second, to answer your question: the thesis has lead to a more articulate role of the design proces when regenerating landscapes, atuned to local, social circumstances. In conventional processes, the role of the designer is at the tale, puzzling the pieces together and seeing that the idea does not get too fragmented and unstylish. There are however two more important steps to be taken beforehand (for which I recommend you to study the whole thesis). These steps are not unfamiliar to the two pragmatic aspects mentioned above and so, they are not unfriendly towards the idea of ‘machine’. The machine metaphor is present in describing causal relationships (cause-effect predictions); these are important to provide a common ground and security for those people that wish to assess whether or not they wish to join the venture of developing a new landscape. The (welcome) dissonant to any fixed machinery thinking is provided by the rather slow and gradual development of landscapes. People can change, as landscapes change and thereby initial causalities can change. This is what is magical and unique in landscape development and this is what needs to be taken into account when considering the machine-aspect in a developing landscape. The machine may be static for a while, but will change and so will the opinions, aesthetic references and social inclusions. At least, that is what Lian and Flore have brought upward from a depth that many already recognize unconsciously, but do not yet include academically. Thanks Paul for your reaction. I agree with you, but would like to add a word from my perspective. Our thesis was not meant to question the landscape machine concept as such. I believe it is a concept that stands on its own and you can either agree or disagree on its terminology. For us it was much more interesting in this project to look at the practical applicability of this type of concept in real life, in social context. This question of application is relevant for any large-scale impacting landscape plan, whether you call it a landscape machine or not. The excercise we did leads therefore not so much to a revision of the landscape machine concept or terminology, but rather to an increased consciousness of the human layer within the design. As I see it, a machine doesn’t work without someone to operate it. Likewise, a landscape needs maintenance. There are many ways to organise this human role within the landscape, and our thesis shows that it is crucial to deliberately ‘design’ this role, especially in regard to existing social mechanisms and existing local attachments to the landscape. Without doing so, large-scale landscape change is bound to run into resistance and may never take place. In my opinion, this is a very crucial point of discussion within the landscape machine concept, because without it, there is no real-life value of the concept, and it stays an academic excercise. This work is really good cut i can’t access to the extended version. Maybe some technical problem. Is possible to get it by e-mail? I’m an architecture student and i’m on landscape Master and i would like to develop a project inspiring on this amazing concept of landscapemachines! Thank you in front for your help.